With so many options on offer for a trip to the Arctic it’s hard to know where to start. 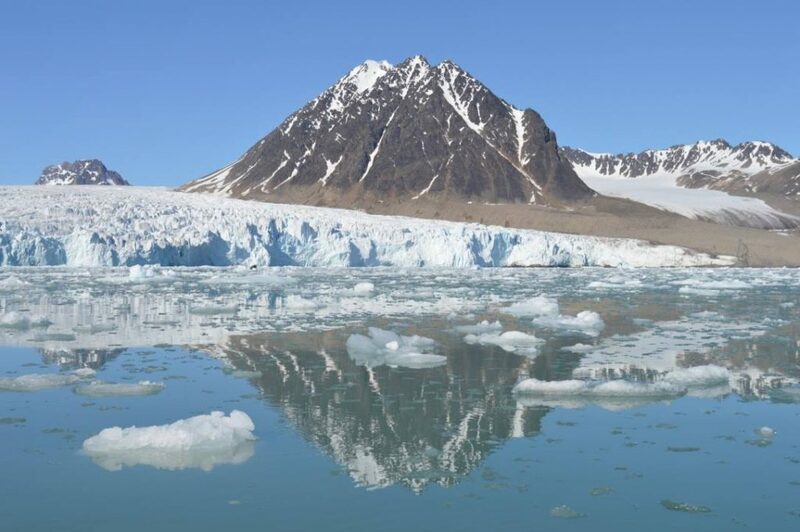 However for a first trip there, you can’t go too far wrong with an expedition cruise around Svalbard which is an archipelago making up part of the Norwegian Arctic. The starting point for most of these trips will be from Longyearbyen, the northern most city in the world. Sitting at 78’14 North with a population of around 2500 inhabitants it’s worth spending a couple of days there to soak up it’s interesting history and enjoy some of the local activities on offer there which include dog sledging amongst other things. The cruise’s all operate in the summer time which means you’ll get to experience the 24 hour daylight or ‘midnight sun’, a concept that is hard to get used to no matter how much time you spend there. Stunning landscapes in the Arctic. Photo credit: Simon Evans. Having checked in to the ship and gone through the introductions and safety procedures the 60 passengers on board our ship, the Ocean Nova, settled down for the first dinner of our 12 day trip. No sooner were we tucking in to our starters when a blue whale was spotted outside the window. With that everyone ran up on to the decks to witness the largest mammal on earth come to within 50 metres of the ship. Not bad given we were only 2 hours in to the trip! Seals in the Arctic. Photo credit: Simon Evans. Over the course of the voyage the huge volume of wildlife was something we would become accustomed to. 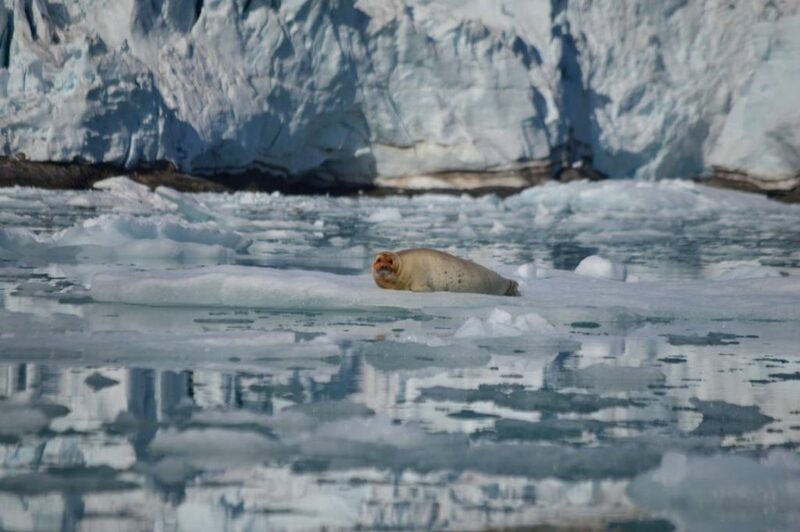 The second day out on the zodiacs brought us a selection of seals chilling out on the ice enjoying the fine weather while the vast glaciers all around provided the ultimate backdrop. With the warm temperatures, the glacier faces were calving all around us and the almighty crashes supplied an impressive audio and visual display. Although this is part of the process of a moving glacier it was both sad and alarming to hear from our guides the rate at which these huge living ice formations are retrieving each year, a depressing reflection of the very real effects of global warming and something all of the expedition team were keen to highlight and educate us on. Sea lions relaxing on the beach. Photo credit: Simon Evans. In addition to the zodiac cruises that allowed us to experience the ice and seals up close, we also took a number of hikes. With a range of distances on offer for the group each time, these fantastic walks allowed us to get up close to nature and experience the Arctic first hand. 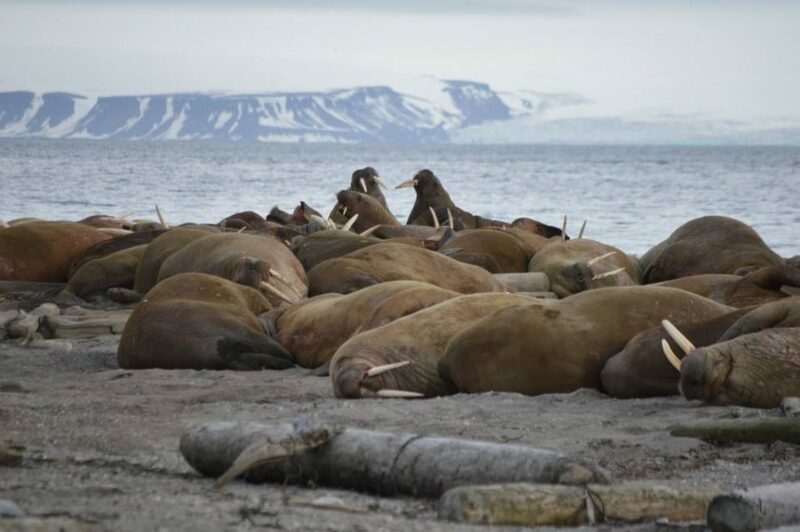 With opportunities to spot a huge array of birdlife, inquisitive reindeers, arctic foxes and a number of different plants alongside some spectacular scenery and varying Arctic weather, the walks provided a hugely enjoyable element to the itinerary. They were also a welcome opportunity to walk off some of the vast volumes of food everyone was consuming three times each day during the very sociable meals that were provided! 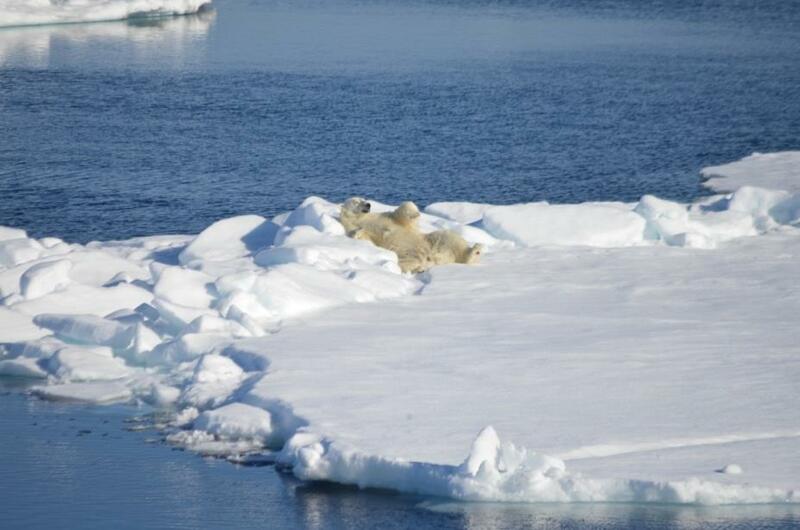 Polar bear taking a nap in the snow. Photo credit: Simon Evans. Although the guides always led these walks armed with a gun, it wasn’t until day 4 when we finally got to witness the magnificent creatures that led to the guides carry these weapons. Setting off from the northern edge of Spitsbergen on the ship, we were heading north towards the pack ice which would continue up to the north pole. With the ice receding and therefore creating a larger gap for the bears to travel from the south to their favoured hunting grounds it was another stark reminder of just how delicate a state this environment is currently in. Having spent the whole morning travelling north with all of the expedition crew and passengers on the look-out for small buttery lumps amongst the vast white landscapes, it seemed as though lady luck may not be with us this time round. However as an increasingly tense ship continued on in to the afternoon, one of the expedition team somehow managed to pick something out in the distance and despite being 4 or 5 miles away we were on our way. An hour or so later the moment everyone had been waiting for finally arrived. The undisputed king of the Arctic and one of the most beautiful creatures anyone on board had been fortunate to witness, the polar bear, was finally in our sites. As our captain carefully manoeuvred our ship to give the best views everyone on board took in the magical views from the comfort of the Ocean Nova. 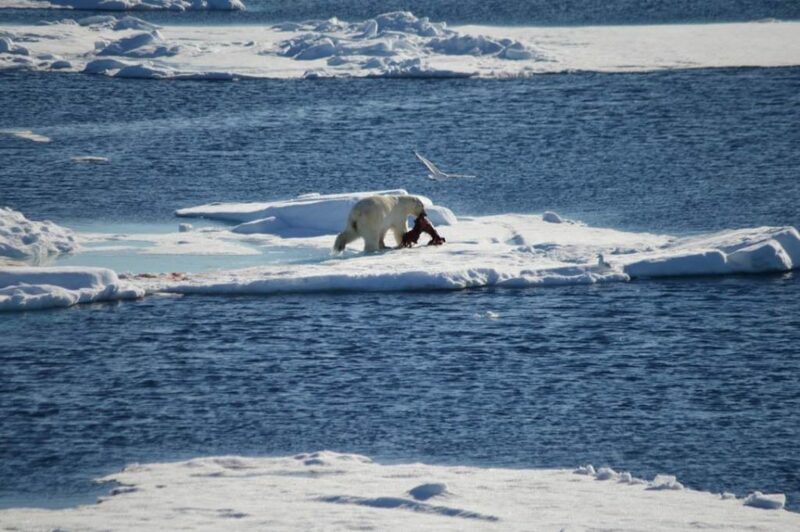 Polar bear eating his meal. Photo credit: Simon Evans. Having spent a couple of hours with this particular bear it wasn’t long before we came across a very large male feeding on a recently caught seal before finishing the day with a further 2 bears hanging out together and also feeding on a seal for their dinner in the brilliant sunshine. A truly magical way to finish off an extraordinary and very special day. The rest of the trip didn’t disappoint either with a family of Arctic foxes and a huge pod of beluga whales amongst the highlights. For those with a truly adventurous or just plain crazy spirit, there was also the opportunity to take a polar plunge in the icy Arctic waters, something that had to be done! Outside of the daily excursions the expedition crew provided a range of informative lectures ranging from subjects including the marine mammals we were seeing each day to the rock formations and history of the region. As the trip came to an end and the reality of becoming connected with the outside world for the first time in nearly two weeks set in, it was fair to say the Arctic had well and truly delivered a completely unique experience and captured every single passenger’s heart. Having being fortunate enough to experience this, it’s time to start spreading the word! Do you want to have your own unique Arctic experience and see polar bears and arctic foxes with your own eyes? Contact Chimu Adventures and see explore the possibilities.